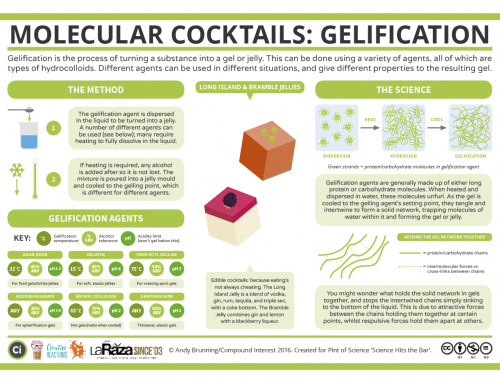 For the fifth in the ‘Alcohol Chemistry’ series, we turn to gin. 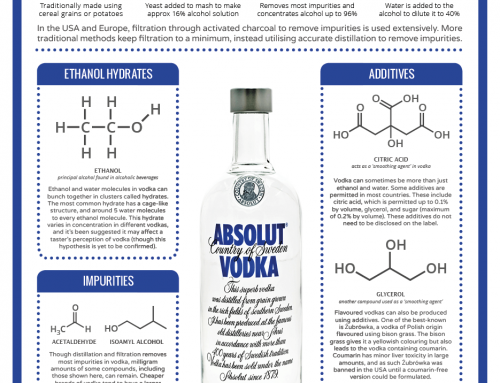 As with other types of alcohol, there are a huge number of different chemical compounds present, but it’s possible to identify a range of significant chemical contributors to its aroma & flavour. 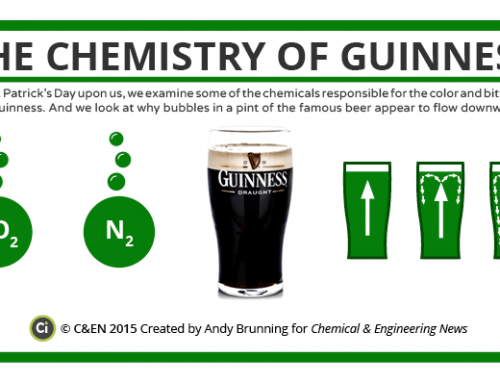 Here, we take a look at those compounds and where they come from. Gin is a spirit that we’ve been making for centuries; although Franciscus Sylvius, a Dutch physician and scientist, is often credited with its discovery in the 17th century, references to gin (or genever as it was also known) exist as far back as the 13th century. Sylvius originally conceived it as an concoction for the treatment of kidney and bladder problems, but its popularity as a recreational drink later soared. Its popularity in England was spurred by heavy government duties on imported spirits, as well as the fact that gin production was not required to be licensed. This growth in popularity was also accompanied by a gradual decline in its reputation, however, with it being blamed for a range of issues, from social problems such as public drunkenness, to increases in death rates. Gin’s reputation has since largely recovered, although some references to these associations still survive in English parlance – ‘Mother’s Ruin’ is still a widely known alternative name for the spirit. Much like other spirits, gin can come in a number of varieties. The primary distinction between gins is whether they are distilled gins, or compound gins. Making compound gin merely involves the flavouring of the neutral spirit with botanical ingredients, with no further distillation process involved. Distilled gin, meanwhile, does involve redistillation along with the botanical ingredients added. There are several varieties of distilled gin, with the exact number varying according to source and mode of classification. From the perspective of the process used to create the gin, this can be simplified to two different varieties: pot-distilled, and column-distilled. The earliest styles of gin were created using the pot-distilled method, distilling a fermented grain-derived mash with added botanicals for flavouring. In some cases, this is then aged in a barrel, much like whisky or wine. The gin produced by this process is often amber-coloured, rather than the colourless spirit we more commonly associate with the name. Column-distilled gin, on the other hand, involves the distillation of spirit from fermented mash, and produces a much more highly concentrated alcohol. This distilled spirit is then subsequently distilled with botanical ingredients in a similar manner to the pot-distilled method. The botanicals are often packed in a basket above the spirit, rather than in it, so that the hot alcohol vapours act to extract flavour compounds from them as they pass through during distillation. The spirit obtained by this method is commonly colourless, and less strongly flavoured than pot-distilled gins. London Dry Gin is an example of such a gin. Before compounds from the botanical ingredients are extracted into the gin, the spirit is essentially flavourless. The flavour that’s imparted depends on the exact ingredients added, the specifics of which, for most gin makers, are a closely guarded secret. However, in the EU at least, the dominant flavour must be that of juniper berries. 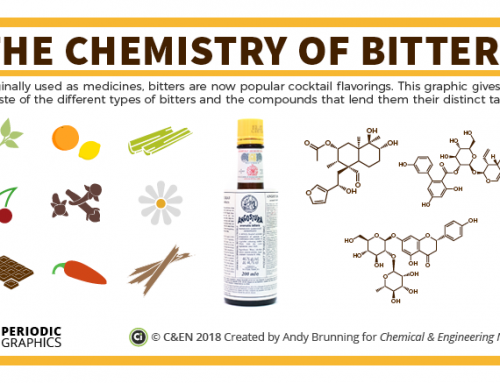 These contribute a wide range of terpene compounds to the gin: alpha-pinene, beta-myrcene, limonene, gamma-terpinene, p-cymene, sabinene, and beta-pinene. Some of these are also contributed by other additions; for example, limonene is extracted from dried citrus fruit peels that may also be added during the redistillation process. Generally, they tend to confer woody and herbaceous tones to the flavour of the gin. Oxygenated terpenes also play a part, and these too come from juniper berries. In some styles of gin, juniper berries are the only flavouring that is used; for example, the German Gin variety can only be flavoured with juniper berries, under German law. Most others, however, include other botanicals to enhance the flavour. Most common is coriander. Linalool, the primary compound in the essential oil of coriander seeds, imparts a woody, spicy flavour, whilst other compounds found in the essential oil, such as geranyl acetate, have also been detected in gins. Other ingredients that are used in some varieties of gin include anise, angelica, almonds, cinnamon, cassia root, and nutmeg, amongst many others. All of these can add their own flavour compounds to the mixture, resulting in a complex cocktail of flavours. 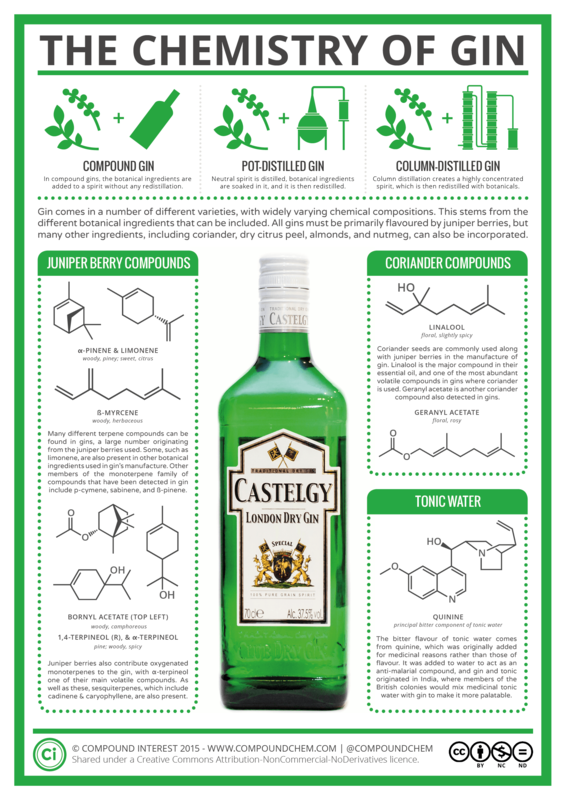 Like most other alcoholic beverages, no one brand of gin will have the same chemical composition as another. Finally, it’d seem remiss to discuss gin without discussing one of the most common beverages it’s found in conjunction with: tonic water. Tonic water’s bitter flavour comes from the presence of the compound quinine, though again, its purpose was originally a medicinal one. Quinine is an anti-malarial compound, and was commonly added to water by British colonists in India and Africa for this purpose. The bitter taste of the water didn’t sit well with everyone, however, and many turned to mixing tonic water with gin to mask the bitter taste – and so the gin and tonic was born. These days, tonic waters still contain quinine, albeit at a much lower level, with it being present only in the amounts necessary to impart flavour. 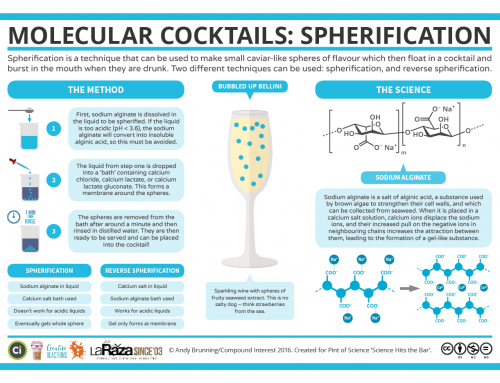 Previous alcohol chemistry entries: Beer, Red Wine, Champagne, Whisky.